Styling is clearly a FIAT 500 strength. When you first look at the car, you might think it’s a product of a Pixar movie rather than Italy. The car is “cute” and the proportions are perfect. You get large, nicely styled machined aluminum rims, chrome details and large bubble lights. The 500 has a 90.6-inch wheelbase and is only 139.6 inches long. The FIAT 500 is a member of the European A-segment and is the smallest four-seater to hit the American market in some time. The only car that is smaller than the FIAT 500 is the Smart Fortwo, which is basically a glorified golf cart with two seats. The interior styling is slightly less cute and quite a bit more luxury sport with a very cool retro Italian feel that really works. The multi-colored interior has two shade seats, and trim to match the exterior paint. The main gauge is quite large and supplies all the driver info in one easy to read location. The outer ring is for the speedometer, the inner for the tachometer and the center LCD displays driver warning, exterior temperature and the time. A nice touch is a TomTom navigation unit with a custom mount atop the dash. The FIAT is fairly tall considering it’s compact length. This height puts the driver in a fairly high driving position compared to most compacts, which is a fantastic feature here in Colorado were 80% of the vehicles on the road are SUVs, you don’t feel quite as small. The front seats are comfortable, nicely bolstered and even heated and the drivers seat includes a fold down armrest, a nice touch that makes the car much more comfortable to drive. The tilt steering wheel is comfortable and has controls for the radio and cruise control. The back seat is surprisingly more comfortable than a MINI, despite the car being much smaller overall. At 6′ 2″ I can fit in a rear seat, there isn’t any extra room but I can actually fit. Overall the interior finishes make the car look far more expensive than it is. The FIAT 500 Sport is powered by a 1.4-liter four-cylinder that puts out 101 horsepower at 6,500 rpm and 98 foot-pounds of torque at 4,000 rpm. This is the first engine offered in North America with FIAT’s “MultiAir” valve control system. The system, by more flexibly controlling the intake valves, offers 10 percent more peak power and up to 15 percent more low-end torque with up to 25 percent better fuel economy and 60 percent lower emissions. The FIAT has a very low curb weight, but even so the 1.4 liter has a difficult time motivating the car into action. Putting the car into “Sport” mode helps, but I still found myself asking for more. Shifting leaves something to be desired as well. The shifter is high-mounted front and center. The high position give the car more of a cargo-van feel than the sporty feeling I was looking for. The shifter’s somewhat clunky operation didn’t help. Fuel economy should be outstanding given the vehicles low curb-weight and small MultiAir engine, but it’s not. The EPA rating of 30 city and 38 highway are beaten by many larger and more powerful compacts, and that’s with the five-speed manual transmission. With the six-speed automatic the 500 only manages 27/34. The FIAT 500 doesn’t back the MultiAir hype well, but perhaps the benefits will be more evident when paired to a larger engine that doesn’t have to strain like the 1.4. My expectations were high for the 500’s handling and I wasn’t disappointed. Steering is snappy and precise and the car lends itself to being tossed into turns quite nicely. The high, upright seating position is somewhat unfortunate when you decide to drive the FIAT into a turn, but it doesn’t ruin the fun. 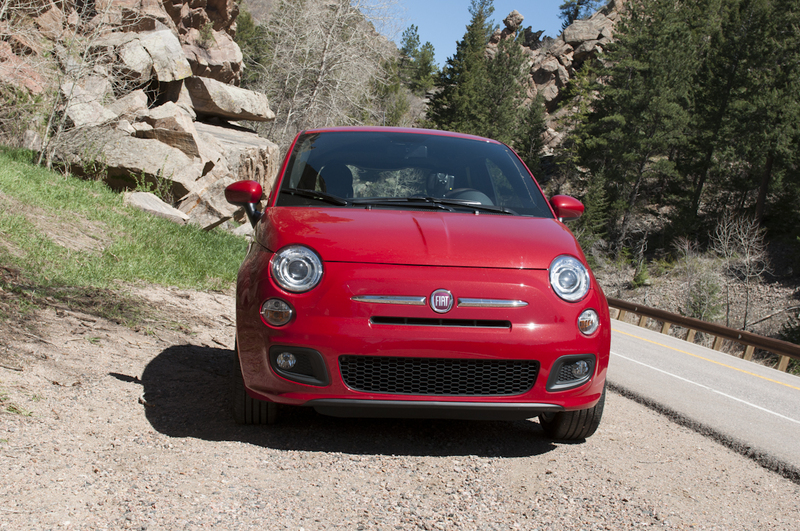 The FIAT 500 Sport offers a clean, comfortable ride and the passenger cabin stays relatively quiet over rough pavement. The Sport’s stiffer suspension does make the car a bit jumpy through rough surface turns, but overall the car’s handling stays true. The FIAT 500 Sport checks in within a few hundred dollars of a Ford Fiesta and about $6,000 below a comparably equipped Mini Cooper. The FIAT 500 Sport is the smallest four seater in the States and it offers up the best in class interior and a fun ride. The FIAT 500 Sport checks in at $18,000. Our car came in at $19,500 with a few options. By now you might think I was pretty disappointed with the FIAT, I wasn’t. The FIAT is a an excellent car that is marred by a few things it does badly. The car is endearingly cute on the outside and incredibly well finished on the inside for the price point. The car handles like a dream and has an interior that is much quieter than the competition. Unfortunately, the car’s sporty handling isn’t paired to a capable power-train.